The highly anticipated sequel to ElectroMaster has arrived! Delica and her talking cat Saten are hungry! Lucky for them they know how to turn the monsters that infest the nearby forest into fruit. Your goal is to survive long enough to collect enough fruit to feed yourself and the locals. The controls are simple: hold your finger on the screen and Delica moves towards it. 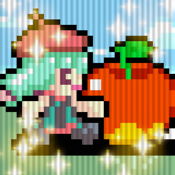 To turn monsters into fruit start a swipe on her and drag across any nearby monsters. This pixie dust trail you create will freeze any monsters you select, and upon your release will turn them all into fruit! If you ever get into danger you're only a two finger tap away from summoning a spell to clear the screen (It'll cost you though). When you've collected enough to satisfy a home's quota drop by a nearby house, it's that easy. With over 100 missions in the story mode and a Time Attack mode in which to hone your skills, you won't be able to put it down.